Sometimes, I would like to umount a usb device, but I get a drive is busy error. How do I find out which processes or programs are accessing the device? Use lsof | grep /media/whatever to find out what is using the mount. Also, consider umount -l (lazy umount) to prevent new processes from using the drive while you clean up. Most of the time, the best command to use is lsof (“list open files”). where /media/usb0 is the mount point of the USB drive or other filesystem to unmount. +f -- tells lsof to treat the subsequent argument as a mount point; it usually, but not always, manages on its own, so that lsof /media/usb0 also works. This finds open files (even unlinked ones), memory mapped files, current directories, and some more obscure uses. You'll need to run the command as root to get information on other users' processes (and I think there are unices where lsof has to be run as root). mount points: you can't unmount /foo if /foo/bar is a mount point. mount devices: you can't unmount /foo if /foo/bar is a mounted block device or loop-mounted regular file, or if it is the source of a Linux bind mount. NFS export: lsof won't detect that a tree is exported by a kernel NFS server. 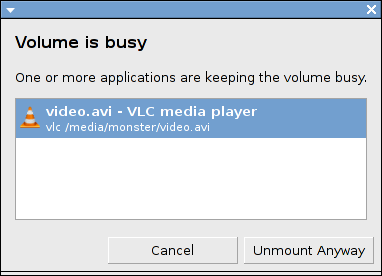 If you use GNOME, unmounting via Nautilus will display a message stating which process is still using the drive, and the file it's using. an unmount can hang in the vx_softcnt_flush() call. The hang occurs because inotify watches increment the i_count variable and cause the v_os_hold value to remain elevated until the inotify watcher releases the hold. In this case, I would not be able to unmount /usr/ports until user _pbuild had finished running those two make processes. This is a common pitfall: You su to a different user (either root or any other user), change to the directory of a mounted device, and then log out as that user. When you forget that you left in that directory, you can try and find until you are blind. lsof does show the shell which current directory is using that device. You might want to su as that user again to change your directory. Not the answer you're looking for? Browse other questions tagged process open-files unmounting or ask your own question. How can I shutdown after unmounting a USB device from the command line? Which user is running the most processes? How to get all processes, currently running in kernel mode?